Fáilte go dtí an chéad eagrán de Nuachtlitir Chomhar Dún Chaocháin Teo. Ins in eagrán seo tá cuir síos ar pharóiste Chill Chomáin, ar chúlra, ról agus gníomhaíochtaí an chomharchumainn agus ar Chúigear Ros Dumhach atá i bpríosúin i gCnoc na Seimre ón 29ú Meitheamh 05 mar gheall ar an seasamh a thóg said in aghaidh an chomhlachta ollmhór Shell i gcomhphairtíocht le Statoil agus Marathon atá i mbun togra Gháis na Coiribe a fhorbairt. Tá Micheál Ó Seighin, Cathaoirleach an chomharchumainn, mar dhuine den chúigear. Béimid ag coinneáil súil ghéar ar an togra seo sna míonna atá amach romhainn. Tá béim níos mó ná ariamh ar chúrsaí pleanála teanga agus céard atá i ndán don Ghaeilge amach anseo. Chuir an comharchumann iarratas ar thionscnamh pleanála teanga chuig an Roinn Gnóthaí Pobail, Tuaithe agus Gaeltachta le anailís a dhéanamh ar staid na Gaeilge sa pharóiste agus le plean teanga a fhorbairt agus a chur i bhfeidhim bunaithe ar thorthaí na hanailíse sin. Ar ndóigh braitheann caomhnú, buanú agus leathnú na Gaeilge ar dea-thoil agus ar chomhoibriú an phobail áitiúil i bpáirtíocht le heagraisí éagsúla stáit agus fó-stáit. Mar a deireann an seanfhocal “Is ar scáth a chéile a mhaireann na daoine”. Welcome to the first edition of Comhar Dún Chaocháin Teo’s Newsletter. This issue features a description of the parish of Cill Chomáin, the background, role and activities of the comharchumann and an open letter from the men known as the Rossport Five who are imprisoned in Cloverhill Prison since 29 th June 05 because of the stand they took against the corporate giant Shell and its partners Statoil and Marathon, the developers of the Corrib Gas project. Micheál Ó Seighin, chairman of the comharchumann, is one of the five. We will be keeping a close eye on this project in the months ahead. There is more emphasis than ever on language planning and what the future holds for the Irish language in particular. To this end the comharchumann submitted an application to An Roinn Gnóthaí Pobail, Tuaithe agus Gaeltachta to undertake a language planning project. This project proposes to carry out an analysis of the current status of the Irish language in the parish and to develop and implement a language plan based on the results of the analysis. The preservation, strengthening and expansion of the Irish language depend on the goodwill and co-operation of the local community in partnership with various state and semi-state agencies. “Is ar scáth a chéile a mhaireann na daoine”. Tá paróiste Chill Chomáin suite tuairim is leath-bealaigh idir Bhaile an Chaisil agus Béal an Mhuirthead ar an gcósta thuaidh in iar-thuaisceart Condae Mhaigh Eo. Luíonn Cuan an Inbhir Mhóir ó thuaidh agus siar uaidh agus Bá Dhún na nGall soir ó thuaidh de. Roimh a roinneadh suas é sa naoú gcéad déag bhí an paróiste ar cheann de na paróistí a ba mhó in Éirinn. Achar 22,055.34 heictéar atá ann inniú. Is ceantar fíorálainn Cill Chomáin a bhfuil an-éagsúlacht ag baint leis ó thaobh tírdhreacha de. Tugann an iargúltacht agus an fhíántacht pearsantacht faoi leith don áit. Tá an charraig tollta ag an bhfarraige ina cuanta beaga agus cinntíre, stácaí agus pluaiseanna, ag cruthú an tírdhreach ailt agus farraige is deise in Éirinn de réir barúil na saoi. Tá na hailt 255 méadar ag Barr na Binne Buí agus 304 méadar ag Glinsc. Ar feadh an chósta tá tránna áilne sábháilte ag Port a’ Chlóidh, An Rinn Rua agus ó dheas ón gCorrán Buí, áit a bhfuil an-chuid dumhaigh agus ceann de na machair is sainiúla sa tír. Níos fuide isteach ón gcósta tá réimse mór de bhratphortach, áit a mbaintear móin don tine leis an eisleán. 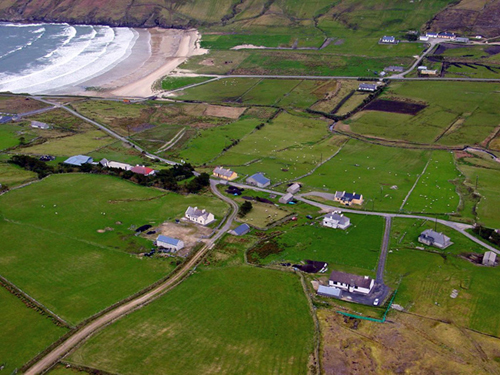 The parish of Cill Chomáin is located approximately midway between Ballycastle and Belmullet on the north coast road (R314) in north west County Mayo. Broadhaven Bay lies to the north and west and Donegal Bay to the north east. Before it was divided in the nineteenth century the parish was one of the largest in Ireland . Todays boundary takes in 22,055.34 hectares. Cill Chomáin is an area of great physical beauty and contrast. The remoteness and ruggedness of the landscape give it a special character. The rock has been carved by the sea into jagged headlands, seastacks and caves, creating what some writers have described as the most spectacular sea-cliff scenery in Ireland . 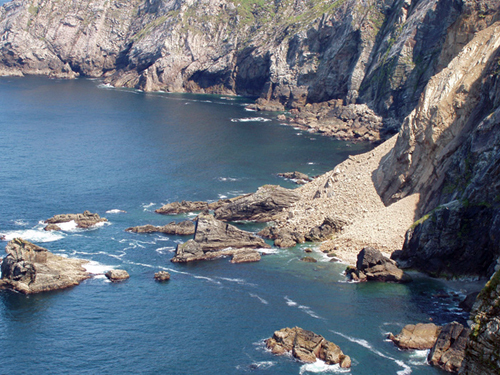 These cliffs reach a height of 255 metres at Barr na BinneBuí and 304 metres atGlinsc. Along the coast are beautiful unspoilt beaches at Port a’ Chlóidh, An Rinn Rua and south of Corrán Buí, where there are numerous sand dunes and this area is considered one of the most important machair sites in Ireland. Further inland is an extensive tract of blanket bog where turf is harvested in the traditional manner for domestic fuel. Is comharchumann forbartha pobail Comhar Dún Chaocháin Teo atá cláraithe le Clárlann na gCara-Chumann ón 28ú Márta 1995. Tá sé mar ráiteas aidhme aige oibriú go gníomhach ar shon forbairt theangeolaíocha/chultúrtha, bhonneagartha, oideachasúil agus shóisialta pharóiste Chill Chomáin agus acmhainní nadúrtha agus daonna a fhorbairt ar bhealach chomhtháite. Tá oifig chláraithe na h-eagraíochta lonnaithe sa tSeanscoil i gCeathrú Thaidhg. Comhar Dún Chaocháin Teo, a community development co-op, was registered with the Registry of Friendly Societies on 28th March 1995 . Its mission is to work in a proactive way to promote the linguistic/cultural, infrastructural, educational and social development of the parish of Cill Chomáin and to develop in an integrated way the material and human resources of the area. The registered office of the organisation is located in the Seanscoil, Ceathrú Thaidhg. Ó bunaíodh é i 1995 tá Comhar Dún Chaocháin Teo ag forbairt réimse leathain tograí atá pobal- agus teanga-bhunaithe agus ag cuir seirbhísí agus áiseanna ar fáil do phobal Dhún Chaocháin. I 2001 leathnaíodh amach ceantar feidhme na h-eagraíochta agus anois tá sé ag freastal ar pharóiste Chill Chomáin. Tá go leor oibre déanta i gcaomhnú agus i gcur chun na Gaeilge i ngnéithe sainiúla de shaol agus de shaíocht an phobail mar chúram leanaí, imeachtaí óige, cúrsaí oiliúna, comharthaíocht, foilseacháin oidhreachta agus turasóireachta, féiltí arl. Since it was set up in 1995 Comhar Dún Chaocháin Teo has developed a wide range of community and language-based projects and provided services and amenities to the community of Dún Chaocháin. In 2001 the area served by the co-op was extended and it now includes the parish of Cill Chomáin. Much work has been undertaken in the preservation and promotion of the Irish language in various aspects of the everyday life of the community such as childcare, youth activity, training courses, signage, cultural and tourism publications, festivals etc. t-Seanscoil a chóiriú agus a dheisiú chun feidhmiú mar ionad pobail. Le cuidiú airgeadú ón Roinn Ealaíon Oidhreachta, Gaeltachta & Oileáin (mar a bhí sé ag an am) agus ón Roinn Leasa Shóisialaigh rinneadh go leor oibreacha feabhsúcháin uirthi - córas séarachais agus uisce, teas lárnach, urlár úr, athchóiriú ar an tsean-séileáil, díon úr, leithris - agus go deiridh cuireadh cistin agus seomra cultúrtha / traenála / taighde léi. Ionad il-fheidhmeach atá ann inniú ina bhfuil Naíonra Dhún Chaocháin, Seirbhís Iar-scoile Dhún Chaocháin agus oifig Chomhar Dhún Chaocháin Teo lonnaithe - áis phobail ar fiú a bheith bródúil aisti. From the mid-seventies the committee of Coiste na Seanscoile set themselves the task of repairing and renovating the old school in Ceathrú Thaidhg to serve as a community centre. With financial assistance from The Department of Arts, Heritage, Gaeltacht and the Islands (as it was then known) and the Department of Social Welfare, many improvement works have been carried out including the installation of water and sewerage systems, central heating, a new roof, the renovation of the old ceiling to its original form, new floors, toilet facilities and more recently the addition of a kitchen and cultural / training / research centre. The Irish pre-school (Naíonra Dhún Chaocháin), the after-school service (Seirbhís Iar-scoile Dhún Chaocháin) and the office of Comhar Dún Chaocháin Teo are all located here. Today the former school serves as a multi-purpose facility of which the community can justifiably be proud. Le blianta beaga anuas eagraíodh cúrsaí éagsúla oiliúna mar shampla :- Sabháilteacht ar an bhfarraige agus Radio VHF agus LRC d’iascairí áitiúla i gcomhar le BIM ; Treoraíocht mara agus tuaithe i gcomhar le Institiúid Teicneolaíochta na Gaillimhe-Mhaigh Eo ; Treoraíocht sléibhe i gcomhar le Institiúid Teicneolaíochta na Gaillimhe-Mhaigh Eo ; Cócaireacht do mhná tí áitiúla i gcomhar le CERT ; Garchabhair i gcomhar le Civil Defence ; Fuáil, gúnadóireacht agus ceirdeanna ; Forbairt pearsanta ; Péintéireacht tírdhreachta ; Caoladóireacht ; Scileanna riomhaireachta ; Aeróbacha ; Damhsa seite ; Bun-ranganna Ghaeilge (ciorcal comhrá) ; Cúrsaí traenála do choistí agus foirne na naíonraí i gcomhar le Forbairt Naíonraí Teo. Ba iad Údarás na Gaeltachta, An Roinn Gnóthaí Pobail, Tuaithe agus Gaeltachta agus Coiste Gairmoideachais Condae Mhaigh Eo a rinne páirt-airgeadú ar na cúrsaí seo. Over the years various training courses have been organised including the following :- Safety at sea, VHF and LRC Radio for local fishermen in conjunction with BIM ; Marine and countryside guiding in conjunction with the G.M.I.T. Castlebar ; Mountain Skills in conjunction with the G.M.I.T. Castlebar ; Cookery for local mná tí in conjunction with CERT ; First aid in conjunction with the Civil Defence ; Sewing, dressmaking and crafts ; Personal development ; Landscape and still life painting ; Basketmaking ; Computer skills ; Aerobics ; Set Dancing ; Beginners Irish (ciorcal comhrá) ; Inservice training for the staff and committee of the naíonraí in conjunction with Forbairt Naíonraí Teo. These courses have been part-funded by Údarás na Gaeltachta, The Department of Community, Rural and Gaeltacht Affairs and Mayo Vocational Education Committee. I measc na spriocghrúpaí a dhéanann an comharchumann freastal orthu tá páistí réamhscoile agus bunscoile. Is seirbhísí réamhscoile trí Ghaeilge iad Naíonra Dhún Chaocháin i gCeathrú Thaidhg (a bunaíodh i 1996) agus Naíonra Ghleann na Muaidhe san ionad pobail i nGleann na Muaidhe (a cuireadh ar bun i 2001) atá dá reachtáil ag an bpobal áitiúil agus a dhéanann freastal ar riachtanaisí na bpaistí agus a dtuismitheoirí sna ceantracha seo. Faoi láthair faigheann na tograí cúraim leanaí seo airgeadú foirne ó Rialtas na hÉireann agus páirt-airgeadú ón Aontas Eorpach faoin bPlean Forbartha Náisiúnta 2000 - 2006 tríd an gClár Comhdheiseanna do Chúram Leanaí de chuid na Roinne Dlí, Cirt, Comhionannais agus Athchóirithe Dlí maraon le deontas reatha ó Údarás na Gaeltachta agus Bord Sláinte an Iarthair. Tá coiste Naíonra Ghleann na Muaidhe ag tógáil ionad nua cúraim leanaí in aice an ionad pobail i láthair na h-uaire. Among the target groups catered for by the comharchumann are pre-school and primary school children. Naíonra Dhún Chaocháin in Ceathrú Thaidhg (established in 1996) and Naíonra Ghleann na Muaidhe in Gleann na Muaidhe (set up in 2001) are both community run Irish pre-school services which provide for the needs of children and their parents in these areas. These childcare projects currently receive funding from the Irish Government and are part-financed by the European Structural Funds under the National Development Plan 2000 - 2006 through the Equal Opportunities Childcare Programme of the Department of Justice, Equality and Law Reform. Údarás na Gaeltachta and the Western Health Board also provide funding. The committee of Naíonra Ghleann na Muaidhe are currently building a purpose-built childcare facility adjacent to the community centre. Is mar thoradh ar éileamh ó thuismitheoirí agus ó pháistí a cuireadh Seirbhís Iar-scoile Dhún Chaocháin ar bun, a d’oscail don chéad uair i mí Meán Fómhair 2004. Sé páiste is fiche atá ag freastal uirthi faoi láthair san aois ghrúpa 4 - 12 bliana d’aois. Sé aidhm na seirbhíse ná forbairt iomlán an pháiste a chur chun cinn - forbairt fisiciúil, shóisialta, chognaíochta agus mhothúcháin. Ag comhlíonadh na haidhme seo eagraitear gníomhachtaí éagsúla oideachasúla, ealaíne agus cultúrtha atá suimiúil, spraoiúil agus spreagúil i dtimpeallacht sabháilte, taitneamhach. Tá cluichí boird, leadóg boird, pool, ceol, damhsa traidisiúnta, amhranaíocht, ealaíon, ceardaíocht, ríomhaireacht, cócaireacht, garradóireacht, staidéar timpeallachta, bingo, tráth na gceist arl i measc na himeachtaí atá curtha ar fáil. Tá an tógra seo maoinithe ag Rialtas na hÉireann agus páirt-maoinithe ag an Aontas Eorpach faoin bPlean Forbartha Náisiúnta tríd an gClár Comhdheiseanna do Chúram Leanaí 2000 - 2006 de chuid na Roinne Dlí, Cirt, Comhionannais agus Athchóirithe Dlí. Following consultation with parents and children, Dún Chaocháin after-school service commenced operation in September 2004 and is currently attended by twenty six children in the 4 - 12 year age group. The aim of the service is to promote the total development of the child - physical, social, cognitive and emotional. To achieve this aim a wide variety of educational, artistic and cultural activities which are both enjoyable and challenging are organised in a safe and stimulating environment. These include various board games, pool, music, traditional dancing, singing, art and crafts, cookery, gardening, environmental studies, quizzes, junior bingo, tráth na gceist etc. all through the medium of Irish.This childcare project isfunded by the Irish Government and part-financed by the European Structural Funds under the National Development Plan 2000 - 2006 through the Equal Opportunities Childcare Programme of the Department of Justice, Equality and Law Reform. Tá aitheantas forleathain faighte ag na treorleabhair siúlóide ‘Siúlóidí Dhún Chaocháin’ agus ‘Siúlóidí Iorrais’ i bhfoilseacháin éagsúla mar Lonely Planet, Walking World Ireland, The Irish Times agus Irland Journal. D’oibrigh an comharchumann i gcomhar le Margaíocht Turasóireacht Iar-thuaisceart Mhaigh Eo Teo ar mhapa / bhróisiúr ildaite agus leabhrán eolais do cheantar Iorrais chomh maith. The walking guidebooks ‘Siúlóidí Dhún Chaocháin’ and ‘Siúlóidí Iorrais’ have received widespread recognition in various publications including The Lonely Planet, Walking World Ireland, The Irish Times and Irland Journal. The comharchumann, in conjunction with Margaíocht Turasóireacht Iar-thuaisceart Mhaigh Eo Teo, has also been involved in the production of the Erris map / brochure and information booklet. Is feachtas féin-chabhrach Gluaiseacht na gComhluadar Beo i dtreo bhonneagartha eacnamaíochta agus cultúrtha na háite a neartú. Sé aidhm na gluaiseachta ná próifil an cheantair mar tháirge nó mar cheann scríbe turasóireachta a ardú i measc tíortha Eorpacha (An Fhrainc agus an Ghearmáin go mórmhór). Chuige sin tá suíomh nua idirlíne deartha atá le feiceáil ag www.gaeltacht.info. Rinneadh seoladh ar an bhfeachtas margaíochta seo i dTeach an Ard Mhéara i mBaile Átha Cliath i mí Bealtaine 2005. I láthair ag an seoladh bhí Treasa Ní Ghearraigh, Uinsíonn Mac Graith, Andrew Montague (Leas Ard Mheara Bhaile Átha Cliath a rinne seoladh ar an bhfeachtas), Liam Reamonn agus Ambasadóir na hInde, An tUasal Saurabh Kumar. The Living Communities Movement is a self-help initiative towards the economic and cultural revitalisation of the area. The aim of the movement is to raise the profile of the area as a tourism product or destination particularly among European countries such as France and Germany . To achieve this a new website has been designed which can be viewed at www.gaeltacht.info. This marketing strategy was launched in the Mansion House, Dublin in May 2005. I mí Deireadh Fómhair 2004 cheangail ‘Slí na Sláinte Cheathrú Thaidhg’ isteach sa ghréasán náisiúnta bealaí siúlóide. Ba é Foras Chroí na hÉireann i gcomhar leis an gComhairle Chondae agus an pobal áitiúil a rinne forbairt ar an togra a mholann siúlóid chun dea-shláinte a chothú. Déanann bróisiúirí ildaite dá-theangach agus clár eolais cuir síos ar an tsiúlóid féin. In October 2004 ‘Slí na Sláinte Cheathrú Thaidhg’ became part of a national network of walking routes. Developed by the Irish Heart Foundation in conjunction with Mayo County Council and the local community, the project aims to promote walking as a means to improving health. Details in relation to the walk are outlined in an attractive bi-lingual colour brochure and information board. Ceadaíodh 1,500 euro don chomharchumann, 2,500 euro do Naíonra Ghleann na Muaidhe agus 5000 euro do Chomhlucht Pobail Bhéal Deirg Teo faoin AIB Better Ireland Programme le trealaimh óige a cheannacht. Under the AIB Better Ireland Programme the comharchumann received 1,500 euro, Naíonra Ghleann na Muaidhe were awarded 2,500 euro and Béal Deirg Youth Club received 5000 euro to purchase equipment suitable for youth-related activities. Is mar thoradh ar éileamh ón bpobal a thosaigh an coiste, i gcomhar le Coiste Campaí Samhraidh Iorrais, ag reachtáil sraithe campaí samhraidh faoi Scéim na gCampaí Samhraidh d’Aos Óg na Gaeltachta. Is í an Ghaeilge an teanga feidhme sna campaí, a chuireann imeachtaí siamsaíochta, oideachaisiúil agus cultúrtha ar fáil d’aos óg na háite. Irish Summer Camps, which offer recreational, educational and cultural activities for local children, have been organised in conjunction with Coiste Campaí Samhraidh Iorrais with the assistance of funding from Scéim na gCampaí Samhraidh d’Aos Óg na Gaeltachta. Seoladh feachtas sainiúil sóisialta agus cultúrtha, an chéad togra dá leithead sa tír, i gCeathrú Thaidhg i mí Meitheamh 05. Ba í Gluaiseacht na gComhluadar Beo, Cumann Naomh Uinsíonn de Pól agus an comharchumann a rinne forbairt agus bainistiú ar an togra, a tharraing le chéile cúigear ógánach ó lár chathair Átha Cliath agus cúigear ógánach áitiúil. D’fhan ógánaigh Átha Cliath, atá uilig ag freastal ar Ghaelscoil Coláiste Mhuire, i dtithe áitiúla lán-Ghaelacha le linn an champa. Thug clár imeachtaí seachtaine deis do na rannpháirtithe scileanna éagsúla a fhorbairt mar obair foirne, ceannaireacht agus scileanna cinneacha. Tugadh seans don dá ghrúpa, a bhfuil riachtanais difriúla sóisialta acu, comhoibriú le chéile tríd an ghné atá comónta dóibh - an teanga Ghaeilge. Ba í aidhm an fheachtais ná deis a thabhairt don dá ghrúpa a dtaithí ar an saol uirbeach agus tuaithe a mhalartú, meas a chruthú eatartu agus chur ar a gcumas a bheith muiníneach ina dtimpeallacht sóisialta féin. Agus clár an champa curtha i gcrith tá eiseamláir láidir cruthaithe le haghaidh nascanna eile óige sa todchaí. An innovative social and cultural initiative, the first of its kind in Ireland , was launched in Ceathrú Thaidhg in June 05. Developed and managed by ‘The Living Communities Movement’, the St. Vincent de Paul Society and the comharchumann, the project formed a cultural liaison between five youths from inner-city Dublin and five local youths. The Dublin youths, who attend Gaelscoil Coláiste Mhuire, stayed with Irish-speaking families for the duration of the workcamp. A week-long programme of activity gave the young people participating on the scheme an opportunity to develop various skills including team-building, leadership and decision-making skills. Both groups, who have different social needs, were given a forum to co-operate with each other through their common bond - the Irish language. The purpose of the initiative was to allow the two groups to exchange and respect each others urban and rural life experiences and to empower them to be confident in their respective social environments. The completion of the work programme, in addition to greatly enhancing the area, provides a model for future youth group linkages. Rinneadh obair feabhsúcháin ar na bóithre portaigh seo leanas sa pharóiste le cuidiú airgeadú na Roinne Gnóthaí Pobail, Tuaithe agus Gaeltachta faoi Scéim na mBóithre Áise :- Bóthar Portaigh Ceathrú na gCloch, Bóthar Cruinneoc (Ceathrú na gCloch), Bóthar a’ Churraigh (Port a’ Chlóidh), Bóthar a’ Chladaigh (Ros Dumhach), Bóthar Portaigh Greanphoill, Bóthar an Bhaile Thuas (Gort Milleadha), Bóthar Portaigh Tráigh Ghort Milleadha, Bóthar Antaine (Ros Dumhach) agus Bóthar na Scraithe (Cill a’ Ghallagáin). Ag comhoibriú le Comhlucht Pobail Béal Deirg Teo, deasaíodh Bóthar an Bhaile Thíos, Bóthar an Chreagáin Bhig agus Bóthar na Tamhnaí Móire i mBéal Deirg. The following bog roads have been repaired in the parish with the assistance of funding from The Department of Community, Rural and Gaeltacht Affairs under Scéim na mBóithre Áise :-Bóthar Portaigh Ceathrú na gCloch, Bóthar Cruinneoc (Ceathrú na gCloch), Bóthar a’ Churraigh (Port a’ Chlóidh), Bóthar a’ Chladaigh (Ros Dumhach), Bóthar Portaigh Greanphoill, Bóthar an Bhaile Thuas (Gort Milleadha), Bóthar Portaigh Tráigh Ghort Milleadha, Bóthar Antaine (Ros Dumhach) and Bóthar na Scraithe (Cill a’ Ghallagáin). Working in conjunction with Comhlucht Pobail Béal Deirg Teo, the following roads have been repaired in Béal Deirg :- Bóthar an Bhaile Thíos, Bóthar an Chreagáin Bhig and Bóthar na Tamhnaí Móire. Cuireadh moltaí chuig an Stiúrthóir Seirbhísí i gComhairle Chondae Mhaigh Eo agus chuig An Roinn Gnóthaí Pobail, Tuaithe agus Gaeltachta maidir le Céibh na Rinne Rua, Céibh Phort Durlainne, Céibh Bhéal Deirg agus Droichead Phort a’ Chlóidh. Le cuidiú an chomharchumainn d’éirigh le Comhlucht Pobail Bhéal Deirg Teo airgeadú a aimsiú chun an chéibh áitiúil a fheabhsú agus rinne An Comhairle Chondae an obair feabhsúcháin uirthi i 2001/02. Ba chomhphairtíocht oibre idir An Roinn Gnóthaí Pobail, Tuaithe agus Gaeltachta agus Comhairle Chondae Mhaigh Eo a bhí i leathnú an droichid ag Port a’ Chlóidh i mí Feabhra / Márta ’05 chomh maith. Coinneofar suas na hiarrachtai maidir le feabhsú Céibh na Rinne Rua agus Céibh Phort Durlainne. Representations were made to the Director of Services in Mayo County Council and to The Department of Community, Rural and Gaeltacht Affairs in relation to Céibh na Rinne Rua, Céibh Phort Durlainne, Céibh Bhéal Deirg and Droichead Phort a’ Chlóidh. Assisted by the comharchumann, Comhlucht Pobail Béal Deirg Teo were successful in securing funding to upgrade the local pier and improvement works were carried out by Mayo County Council in 2001/02. The widening of the bridge at Port a’ Chlóidh in February / March ’05 was also a joint initiative between The Department of Community, Rural and Gaeltacht Affairs and Mayo County Council. Efforts regarding improvement works at Céibh na Rinne Rua and Céibh Phort Durlainne are ongoing. Cuireadh oibreacha éagsúla athnuachana timpeallachta i bhfeidhim ina measc glanadh suas ar thránna áitiúla (Trá na Rinne Rua, Tóin a’ Chorráin Bhuí agus Trá Phort a’ Clóidh) agus sna reiligí (Cill a’ Ghallagáin agus Greanaí) le cuidiú muinteoirí agus daltaí Scoil Náisiúnta Cheathrú Thaidhg, foireann na scéime fostaíochta pobail Chumann Lúthchleas Gael Chill Chomáin agus Comhairle Chondae Mhaigh Eo a chuir skip ar fáil. Various environmental enhancement works have been undertaken including the clean up of local beaches (Trá na Rinne Rua, Tóin a’ Chorráin Bhuí and Trá Phort a’ Clóidh) and graveyards (Cill a’ Ghallagáin and Greanaí). The committee were assisted in their efforts by the teachers and pupils of Ceathrú Thaidhg national school, the participants of Cill Chomáin G.A.A. Community Employment Scheme and by Mayo County Council who provided a skip. Cuireadh oibreacha athnuachana i gcrith i mbaile Cheathrú Thaidhg mar shoilsí poiblí, píobáin faoi thalamh le haghaidh sreanganna BSL agus Eircom, áiteanna phairceála, kerbing agus sceallóga thart ar an mbosca ghutháin agus cosán coisithe. Tá na hoibreacha seo páirt-mhaoinithe ag An Roinn Gnóthaí Pobail, Tuaithe agus Gaeltachta i gcomhar le Comhairle Chondae Mhaigh Eo. Village enhancement works undertaken in Ceathrú village include public lighting, installation of underground ducting for ESB and Eircom overhead cables, car parking facilities, kerbing and surface chips around the phonebox and the laying down of a footpath. These works are part-funded by The Department of Community, Rural and Gaeltacht Affairs and Mayo County Council. Sholáthar rannóg timpeallachta an Chomhairle Chondae sé bhanc i gcóir búidéal agus cannaí ag Siopa P.J. Ó Ghearbháin i gCeathrú Thaidhg mar chuid den fheachtas athchúrsála bhruscair. Six bottle banks were delivered to Siopa P.J. Ó Gearbháin in Ceathrú Thaidhg in an effort to encourage recycling and the reduction of waste. Le cuidiú Chomhairle Chondae Mhaigh Eo cuireadh suas comharthaí cloiche le hainmneacha Gaeilge na mbailte fearainn greanta orthu sna bailte seo leanas :- Bun Abhna, Muing na Bó, Gort a’ Creachaire, Barr Thrá, Ros Dumhach, Leana Mhianaigh, Sean Mhachaire, Gob a’ tSailín, Greanaí, Corrán Buí, Muing na Lao, Port Durlainne, Taobh Mór, Sraith a’ tSeagail, Port a’ Chlóidh, Ceathrú Thaidhg, Ceathrú na gCloch agus Cill a’ Ghallagáin. With the assistance of Mayo County Council, boulders engraved with the Irish townland names have been erected in the following locations :- Bun Abhna, Muing na Bó, Gort a’ Creachaire, Barr Thrá, Ros Dumhach, Leana Mhianaigh, Sean Mhachaire, Gob a’ tSailín, Greanaí, Corrán Buí, Muing na Lao, Port Durlainne, Taobh Mór, Sraith a’ tSeagail, Port a’ Chlóidh, Ceathrú Thaidhg, Ceathrú na gCloch and Cill a’ Ghallagáin. Ag comhoibriú le Comhairle Chondae Mhaigh Eo, Signiatec agus Artworks Graphic Design dhearaigh an comharchumann cláranna eolais dhá-theangach do thurasóirí a dhéanann cuir síos ar phointí suimiúla, áiseanna agus seirbhísí. Beidh na cláranna seo lonnaithe ar fud Bharúntacht Iorrais ag Ceathrú Thaidhg, Ros Dumhach, Béal Deirg, Béal an Átha Buí, Barr na Trá, Baile Glas, Dún na mBó, Fód Dubh, Eachléim, Fál Mór, Munhin, Gleann a’ Chaisil, Baile Chruaich agus Inis Bigil. Working in conjunction with Mayo County Council, Signiatec and Artworks Graphic Design the comharchumann were involved in compiling bi-lingual tourist information panels describing local points of interest, activities and amenities. These panels will be located throughout the barony of Erris at Ceathrú Thaidhg, Ros Dumhach, Béal Deirg, Béal an Átha Buí, Barr na Trá, Baile Glas, Dún na mBó, Fód Dubh, Eachléim, Fál Mór, Munhin, Gleann a’ Chaisil, Baile Chruaich and Inis Bigil. Faoi scéim fostaíochta pobail Ghlór na nGael i mí Iúil 1996 a thosaigh Uinsíonn Mac Graith ag déanamh bunobair ar thogra bailiúcháin logainmneacha Dhún Chaocháin. Ina dhiaidh sin thacaigh Údarás na Gaeltachta leis an togra agus bailíodh agus mapáileadh 1,500 logainm áitiúil idir mí Iúil 1998 agus Nollag 1999. Bronnadh gradam ón gComhairle Oidhreachta ar Chomhar Dún Chaocháin Teo i 1998 agus cuireadh na mapaí logainmneacha maraon le ábhar eile oidhreachta ar dhlúthdhiosca Dhún Chaocháin. While participating on a Glór na nGael community employment scheme in July 1996 Uinsíonn Mac Graith carried out preliminary work on the Dún Chaocháin placename collection project. The project received financial support from Údarás na Gaeltachta between July 1998 and December 1999 and during this time 1,500 local placenames were collected and mapped. Comhar Dún Chaocháin Teo were the recipients of a Heritage Council award in 1998 and the placename maps along with other heritage material were compiled on the Dún Chaocháin CD ROM. Reachtáileadh Scéim Bailiúcháin Logainmneacha i mbunscoileanna Ros Dumhach agus Gleann na Muaidhe i 1998 le suim a mhuscailt sa mír seo dár ndúchas. D’éirigh thar cionn leis. In 1998 a very successful placename collection scheme was organised in Ros Dumhach and Gleann na Muaidhe primary schools to generate interest in this aspect of our culture. Idir Eanair 2000 agus Nollag 2001 agus le tacaíocht ó Údarás na Gaeltachta faoin Deontas Spreagúil, rinneadh bailiúcháin, miniúcháin agus mion-mhapáil ar na logainmneacha Gaeilge sna bailte fearainn eile i bparóiste Chill Chomáin. This two-year project (January 2000 to December 2001) which involved the collection, mapping and interpretation of the Irish placenames in the remaining townlands in the parish, received funding from Údarás na Gaeltachta under the Deontas Spreagúil Scheme. Tobar fíoruisce, bailiúchán saibhir luachmhar atá le fáil ag an glúin reatha agus atá caomhnaithe do na glúnta atá le teacht atá sa leabhar ildaite, dhá-theangach "Logainmneacha agus Oidhreacht Dhún Chaocháin - The Placenames and Heritage of Dún Chaocháin" a d’fhoilsigh Comhar Dún Chaocháin Teo. Agus é ag seoladh an leabhair san RDS i mí Eanair 2005 dúirt An t-Aire Uí Chúiv "Má tá muid chun an ghné thábhachtach seo dár ndúchas a chaomhnú tá sé práinneach go ndéanfaimis na mionlogainmneacha a bhailiú, a thaifeadadh agus a mhapáil go cruinn anois, agus na torthaí a chur i láthair an phobail. Is léir go bhfuil sin déanta i gcás cheantar stairiúil Dhún Chaocháin ag na daoine a chuir an saothar álainn seo le chéile." Ba iad An Chomhairle Oidhreachta, Comhairle Chondae Mhaigh Eo agus Údarás na Gaeltachta a rinne airgeadú ar an bhfoilseachán seo. Published by Comhar Dún Chaocháin Teo, the bi-lingual book "Logainmneacha agus Oidhreacht Dhún Chaocháin - The Placenames and Heritage of Dún Chaocháin" has been described as a well of information and a rich and valuable collection which is available to the current generation and is now preserved for future generations. Minister Éamon Ó Cúiv, while launching the book in the RDS in January 2005, outlined the importance ofdocumenting, recording and accurately mapping local placenames as an integral part of preserving our heritage and making the results available to the public. "It is evident that this has been carried out to a high standard in Dún Chaocháin by the authors of this wonderful publication," he stated. The publication received financial backing from The Heritage Council, Mayo County Council and Údarás na Gaeltachta. Eagraitear Féile Oidhreachta Dhún Chaocháin, a dhéanann ceiliúradh ar chultúr agus oidhreacht na háite, go bliantúil. Tá taispeántas griangrafanna, ceol traidisiúnta, barbeque agus lá spóirt ag an Rinn Rua mar chuid de chlár na féile. Féile Oidhreachta Dhún Chaocháin, a festival celebrating local culture and heritage, is organised annually and includes a photographic exhibition, traditional music, a barbeque and a sports day at An Rinn Rua as part of its programme of activity. Ag comhoibriú le Cumann Lúthchleas Gael Chill Chomáin agus le Údarás na Gaeltachta, d’ullmhaigh an comharchumann iarratas cuimsitheach ar Scéim Fostaíochta Pobail le haghaidh an pharóiste a cuireadh chuig FÁS. Díríonn an plean ar fheabhsú agus athnuachan timpeallachta agus soláthar seirbhísí óige go mórmhór. Thosaigh an scéim i mí Márta 2004. Working in co-operation with Cumann Lúthchleas Gael Chill Chomáin (Kilcommon G.A.A.) and with Údarás na Gaeltachta the comharchumann prepared a comprehensive application for a community employment scheme for the parish which was submitted to FÁS. The plan focuses primarily on environmental improvement / enhancement and on the provision of youth activities. This scheme commenced in March 04. Tá plean athnuachana timpeallachta an chomharchumainn san áireamh i gclár oibre na scéime shóisialta tuaithe sa pharóiste. The comharchumann’s environmental enhancement plan forms part of the Rural Social Scheme’s programme of work in the parish. Cuireann oifig an chomharchumainn eolas / cuidiú ar fáil do choistí éagsúla deonacha maidir le forbairt agus bainistiú tograí, foinsí maoinithe arl. Cuirtear eolas agus foirmeacha iarratais ar fáil faoi scéimeanna éagsúla mar shampla feabhsú tithíochta, bóithre portaigh, scéim feabhsúcháin áitiúil an Chomhairle Chondae, deiseanna traenála arl. Tá seirbhísí cóipéala, laminating agus facs le fáil chomh maith. The office of the comharchumann provides information / assistance to various voluntary groups in relation to developing and managing projects, sourcing funding etc. Information and application forms are available on various schemes including home inprovement grants, repair of bog roads, training opportunities etc. Photocopying, laminating and fax services are also available. Ó bunaíodh é, tá Comhar Dún Chaocháin Teo ag obair go dlúth le heagraisí éagsula stáit agus fó-stáit ar mhaithe le forbairt an pharóiste, iad seo leanas go mórmhór :- An Roinn Gnóthaí Pobail, Tuaithe agus Gaeltachta, Comhairle Chondae Mhaigh Eo, Údarás na Gaeltachta, Bord Iascaigh Mhara, An Roinn Dlí, Cirt, Comhionannais agus Athchóirithe Dlí, Forbairt Naíonraí Teo, Bord Sláinte an Iarthair, An Roinn Gnóthaí Sóisialacha agus Teaghlaigh, FÁS, Glór na nGael agus Coiste Gairmoideachais Chondae Mhaigh Eo. Tá súil againn leanacht leis an gcomhoibriú sna blianta atá amach romhainn. Since its foundation Comhar Dún Chaocháin Teo has worked closely with a number of state and semi-state agencies in its efforts to further develop the parish including the following:- The Department of Community, Rural and Gaeltacht Affairs, Mayo County Council, Údarás na Gaeltachta, Bord Iascaigh Mhara, The Department of Justice, Equality and Law Reform, Forbairt Naíonraí Teo, The Western Health Board, The Department of Social, Community and Family Affairs, FÁS, Glór na nGael and Mayo VEC. We look forward to their continued co-operation in the years ahead. We are currently in prison for refusing to allow Shell and their Irish Government partners build a pipeline close to our family homes. Our crime was to refuse access to our lands. We have refused access because of the certainty that if this pipeline as currently proposed ruptures we, our families and neighbours, will die. What would you do if a court ordered you to accept the installation of a potentially lethal pipeline which no state agency has or will take responsibility for? We are currently in prison for an indefinite time until we accept such a pipeline, which we cannot and will not. Would the people of Mayo or Dublin accept a potentially lethal pipeline through the main street in Castlebar or Stephens Green in Dublin ? A pipeline which has a rupture kill zone of several hundred metres. We think not. Our imprisonment was only made possible by the granting of a compulsory order for our lands to Shell by Frank Fahey T.D. while Minister for Marine and Natural Resources. Without that order we would be free men today at home with our families. Instead we are confined in prison cells. Initially we were jubilant and excited for Mayo and the country when we heard of the Corrib gas find. When we learned that the route would traverse Rossport we became concerned and as we looked closer and sought advice we became alarmed. As Irish citizens and mainly traditional second and third generation Fine Gael and Fianna Fail voters we instinctively sought reassurance and support from state agencies and our local politicians and as farmers from the IFA. We were initially fobbed off, then ignored and finally marginalized. As our awareness of the lethal danger to our families grew our concerns turned into resistance. We owe much in particular to the incredible continued support of Jerry Cowley TD & Michael Ring TD and the Fine Gael & Fianna Fail grassroots in Mayo. By comparison we have been shocked by the abandonment in our time of crisis by the Fine Gael leader and local TD Enda Kenny who we now regard as irrelevant in this crisis as a leader. We would also like to acknowledge the massive support we have received from both ordinary Irish citizens and various groupings including ICSA, ICMSA, National Women’s Council, SWP, the Greens, Sinn Fein and Labour along with Louth & Galway county councils, Udaras na Gaeltachta and many other local authorities and organisations. To date the dealings of the Irish government in this project have seen our land rights given to a private company, our families and neighbours very lives endangered and the natural resource of the Irish people given away. This is to such an extent that the Norwegian people, through their state oil company STATOIL holding 38% of the Corrib Field, will receive more from this project than the Irish people who have a 0% holding. In addition the government has provided 400 acres of Coillte land and committed the Irish people to finance a gas pipe from Mayo to Galway to facilitate the outward transport of gas to the UK and Europe . The national interest is a myth that has been fabricated by the Irish government and their partner Shell. The minister Noel Dempsey and his Department are not and have never been innocent bystanders in this crisis but have played a full role alongside Shell in its creation. Despite all of this we, in good faith, acknowledge the attempts of Shell and their government partners to create a period of calm by halting all work on the project in north Mayo and their call for dialogue. We wish to immediately accept this offer and enter into talks to resolve the impasse. To that end we ask Shell and their government partners to immediately stand down their injunction at this time so that we can leave prison to attend these talks. We have been betrayed by our government, marginalized by sections of the media and ignored by the “alternative” government. Instead it has been the people of Ireland who have sustained us during this time of crisis and personal trauma and who have rallied and continue to rally to our aid – thank you. All we demand is for our families and neighbours to be safe in their own homes - no more no less. Tá eolas ar na foinsí éagsúla maoinithe do ghrúpaí pobail agus deonacha le fáil ar shuíomhanna idirlíne www.mayococo.ie nó www.mayocdb.ie ach an nasc Mayo 4 Funding a leanúint. Is togra páirtíochta é seo atá forbartha ag Comhairle Chondae Mhaigh Eo, Bord Forbartha Chondae Mhaigh Eo agus Fóram Pobail Chondae Mhaigh Eo. Information on the various sources of funding that are available to community and voluntary groups can be accessed by logging onto either www.mayococo.ie or www.mayocdb.ie and following the prominent link (Mayo 4 Funding website). This partnership initiative was developed by Mayo County Council, Mayo County Development Board and Mayo County Community Forum.